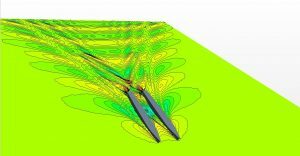 The Report of the Specialist Committee on High Speed Craft of the 26th ITTC Conference in Rio de Janeiro, Brazil (2011) stated that there is a lack of understanding and benchmark data for the shallow water effects on the performance of high speed craft. It is found that as Fd increases and approaches 1 (Fd=1 is defined as the critical regime), the wave resistance can increase significantly. If the vessel has enough power to sustain a larger speed, the depth Froude number increases further towards the super-critical regime (Fd>1), and its resistance, conversely, decreases. Furthermore, concerning a multi-hull vessel, e.g. a catamaran, the interference between the hulls can become negative. That means that the total resistance is smaller than that of the sum of the individual demi-hulls. This feature can be particularly useful for Navies operating both in restricted waters and close to the coast. dangerous spreading of wave wash due to the fact that the rate of decay of the divergent waves in shallow water is much smaller than in the deep water condition. The present project is investigating these two effects. Archie-West HPC has been indispensable to carry on our CFD simulations. In the work so far we aimed to achieve some insights into the transom stern problems and the transcritical shallow water regime (Fd close to one) regarding its differences to the deep water regime. Some interesting phenomena occur, such as the formation of a single transverse wave of substantial amplitude (known as a `soliton`) ahead of the vessel, as shown in Figure 2, hugely changing the wave pattern compared to deep water one, Figure 1. Figure 2. Shallow Water. The Research from this point forwards aims to make our simulations closer to the real conditions, by means of the inclusion of the boundaries of the walls and bottom of towing tanks. Depth and blockage effects cannot be neglected any more, since Model Basin Tests are planned to be conducted. 2. The classical Froude Hypothesis used to identify the Resistance Components, as our results and the more recent literature have been showing us, does not necessarily fit well for high-speed vessels, especially multi-hulls with transom sterns, a type of vessel that has become the widespread benchmark for high-speed in both civilian and military applications since the 90s. Ultimately, the goal is to provide newer and useful insights of the hydrodynamic of high-speed vessels in terms both of design recommendations, towing tank best practices, and operations, both in deep and shallow waters. 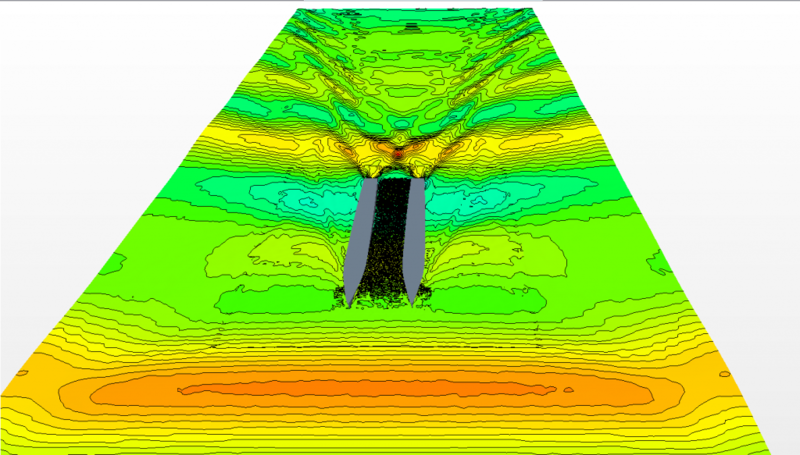 The work has been conducted by means of numerical calculations (CFD and Thin-Ship Theory) and Model Basin Tests are planned for the next months. Hopefully the output of this Research will be beneficial both for the Academia and Maritime Community. This Research Project is sponsored by the Brazilian Government, by means of funds provided by CNPq and Marinha do Brasil (Brazilian Navy). For more information about the project contact Prof. Sandy Day (sandy.day [at] strath [dot] ac [dot] uk), Head of Department of Naval Architecture, Marine and Ocean Engineering at the University of Strathclyde.